The Royal Marine Hotel, whose lawn sweeps down to the harbour, sits in the heart of Dún Laoghaire, just off Marine Road. I first stayed here almost half a century ago, at the end of 1974, and its Victorian façade and lawns never cease to delight me. I walked through the grounds briefly again on New Year’s Day [1 January 2019] after strolling through the streets of Dalkey and before going for a brisk late evening walk on the East Pier in Dún Laoghaire. With the construction of the fine Victorian harbour in 1820, Kingstown or Dún Laoghaire became Ireland’s major harbour as well as a centre for yacht racing and sailing on the east coast of Ireland. Its close proximity to Dublin and impressive waterfront yacht clubs has resulted in Dun Laoghaire staging many major world and European championships since the first recorded Kingstown Regatta in 1828. The Royal Marine Hotel dates from 1828, when a hotel known as Hayes Hotel, and later as Hayes Royal Hotel, stood on this site overlooking Kingstown Harbour and Dublin Bay. The hotel was bought in 1863 by William Dargan (1799-1867), who built the first railway in Ireland between Dublin and Kingstown. Three years earlier, William Dargan acquired the site of the International Hotel in Bray and a terrace of houses on a 900-year lease from John Quin in 1860. The new Victorian hotels in Bray included the Royal Marine Hotel, designed by George Wilkinson, the Esplanade Hotel built in 1860, the Strand Hotel which opened in a house once owned by Oscar Wilde, and the Bray Head Hotel, built in 1862. Now Dargan had elaborate plans for a new hotel in Kingstown. 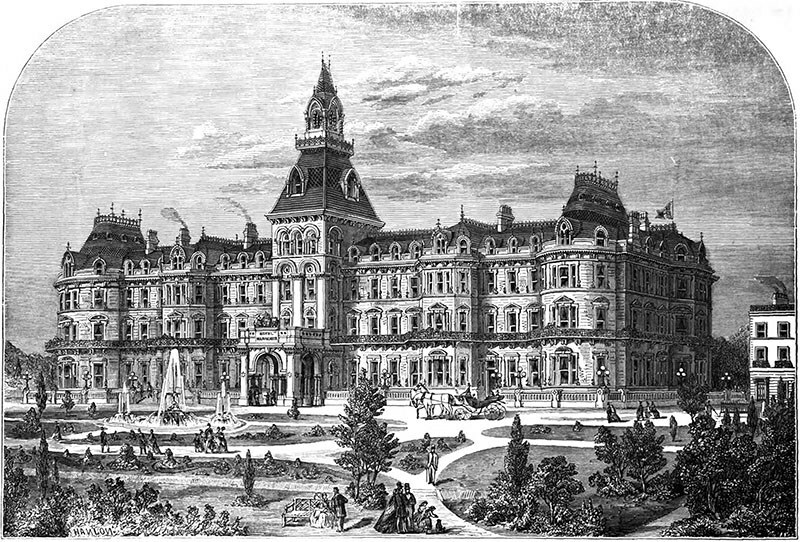 But due to financial constraints these lavish plans were abandoned, the original hotel was remodelled, and the newly developed Royal Marine Hotel first opened its doors in September 1865. The only parts added from the original design were the centrepiece and the south wing. The entire right-hand wing of the hotel was never built as McCurdy planned. The contractor was Cockburn, and the building costs up to October 1865 were estimated at £25,000. It is said the new Royal Marine Hotel contributed to Dargan’s eventual financial ruin before he died in 1867. But ever since it first opened its doors this hotel has been a Dublin and Dun Laoghaire institution. John McCurdy (1824-1885) was appointed the architect for new hotel in 1863, with Thomas A Kelly as superintending architect. John McCurdy, who was born in Dublin ca 1824, was probably a younger son of William McCurdy, who was living at 20 Denzille Street, Dublin, from 1834 or earlier. McCurdy received his professional training in the office of Frederick Darley, architect to Trinity College Dublin, and became clerk of works at TCD in 1850 at a quarterly salary of £25. He supervised the erection of the Museum Building in TCD in the 1855. McCurdy then became inspector of new buildings at TCD with a quarterly salary of £28, as well as receiving fees as superintending architect. He remained the official college architect until his death. He married Lucy Heinekey (1836-1928) in 1857, and they were the parents of Agatha Mary (1858-1927), who married Adam Seaton Findlater (1855-1911), a member of the Findlater family who owned well-known food shops in Dublin, and for five years also owned the Royal Hotel, Bray, also designed by McCurdy. Findlater’s other hotel interests included the St Lawrence Hotel and Royal Hotel in Howth. McCurdy formed an architectural partnership with William Mansfield Mitchell in 1872, and they practised from Leinster Street, Dublin, as McCurdy and Mitchell until 1882. After that, McCurdy worked from the Office of Works at TCD. He was architect to the Commissioners for Education of Certain Endowed Schools in 1873-1883, and to the Benchers of King’s Inns. He was also a Blackrock Township Commissioner from 1864 to 1875. His other works include All Saints’ Church, Proby Square, Blackrock, rebuilding the Bethel Chapel as Christ Church, Dun Laoghaire, the Methodist Church on Victoria Street, Dublin, Glenart Castle, Co Wicklow, the Town Hall in Naas, Co Kildare, and a number of hotels and courthouses throughout Ireland. McCurdy played an active role in the Royal Institute of Architects of Ireland. He was vice-president 1868-1874 and president from 1874 until he died in 1885, and he was also a fellow of the Royal Institute of British Architects (FRIBA, 1876). Just six weeks before his death he led a deputation of architects to meet the new Viceroy, the Earl of Carnarvon. He died at the age of 61 at his home at Elsinore, 25 Coliemore Road, Dalkey, on 12 September 1885 and was buried in Deansgrange Cemetery. Over the past century and a half, the Royal Marine Hotel has hosted many heads of state, kings, queens and celebrities. Queen Victoria, who arrived in Ireland or left from Kingstown on at least four occasions between 1849 and in 1900, is said to have once enjoyed a 16-course breakfast in the hotel shortly after one arrival. The nearby Victoria Fountain commemorates her visit in 1900. The first line wireless report on a sports event was made in 20 July 1898 when Marconi transmitted a commentary on the Kingstown Regatta. Michael Collins is believed to have hidden out in Room 210 with his partner Kitty Kiernan. Laurel and Hardy stayed at the Royal Marine Hotel in 1953 for 33 days from 9 September until 13 October while they were performing at the Olympia Theatre in Dublin. Other celebrity guests included Frank Sinatra and Charlie Chaplin. Since then, the hotel has lost much of its original splendour. The roof renovations in 1960 meant getting rid of the French pavilions, the mansard roof and the Victorian tower and dome. Another part of the hotel was demolished to make way for a conference centre and nearby Gresham Terrace was also demolished in the 1970s to make way for a shopping centre. Today, the Royal Marine Hotel is independently owned and operated by the Neville family from Co Wexford, who bought the hotel in 2003 and completed a complete renovation, restoration and refurbishment programme. The Neville family also owns and runs the Kilkenny River Court Hotel in Kilkenny and the Tower Hotel and Leisure Centre in Waterford. 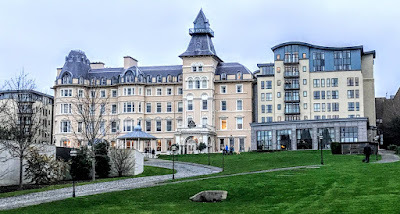 The hotel was the venue for the General Synod of the Church of Ireland in 2016. With its high ceilings, ornate pillars, traditional wide corridors, intricate detail on the cornicing, Victorian staircases and large sash windows, the Royal Marine Hotel is a reminder of a bygone age while still offering the facilities of a modern luxury hotel. During my walk along Castle Street in Dalkey, Co Dublin, on New Year’s Day [1 January 2019], enjoying my exploration of the seven mediaeval castles of Dakley and taking time to get to know the Church of the Assumption, I found myself at Kent Terrace, which links the west end of Castle Street and Barnhill Road, which continues on further west. Nos 1- 4 Kent Terrace is a brightly painted and striking group of four Regency Revival houses built in 1839. These are three-bay, three-storey gable fronted houses, with timber eaves with dog-tooth detailing and drip labels to the windows. The narrow front sites are bounded by cast-iron railings on a rendered plinth wall, with pedestrian gates leading to the granite steps. Each of the entrance doors has applied metal studwork in the medieval manner. All but one of the houses retain their original Gothic style fanlight over the entrance door. 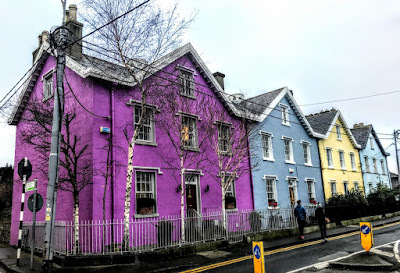 Captivated by this colourful terrace of Tudor-style houses, I came across the colourful story of an architectural dynasty that moved between Kent and Ireland and Kent again. Kent Terrace was designed and built by the architect William Edward Porter (1783-1859) and his son Edward William Porter (1821-1901), who was only a 17-year-old at the time but seems to have had a strong influence in the development. Porter gave his four-house terrace the name Kent Terrace because he had lived in Kent before he moved to Dublin as Clerk of Recognizance at the Court of Chancery. Porter married Anne Coultate, and Frederick William Porter, their second son, was born in Rathmines on 19 October 1821. Frederick moved to London was a pupil of the architect Lewis Vulliamy (1791-1871), who designed houses in Bloomsbury and churches throughout England. However, Frederick soon returned to Ireland and he took up residence at No 1 Kent Terrace, Dalkey, one of the four houses built by his father in 1839. As FW Porter of Kent Terrace, Dalkey, he exhibited three architectural designs at the Royal Hibernian Academy in 1843. As Frederick William Porter, architect, he is listed in the Dublin trades directories as living at 1 Kent Terrace from 1848. Frederick Porter and Sarah Moyle were married in Liverpool in October 1848. Although he continued to appear in the Dublin directories until at least 1853, he had moved back to London by 1849, and was living at 13 Charlotte Street in Fitzrovia when he and WA Boulnois exhibited a design for a county lunatic asylum at the Royal Academy. He was still living at Charlotte Street when he became a fellow of the RIBA in 1855. He succeeded Samuel Angell as Surveyor to the Clothworkers’ Company in 1860, and in this role he visited the Clothworkers’ estates in Co Derry in 1863. Perhaps because of these connections, Porter designed the Church of Ireland parish church in Castlerock, Co Derry (1868-1870). In the Building Trades Directory (1868), he claimed to have built residences in England, Ireland, Spain and Shanghai, although there is no evidence that he travelled to these more exotic locations. 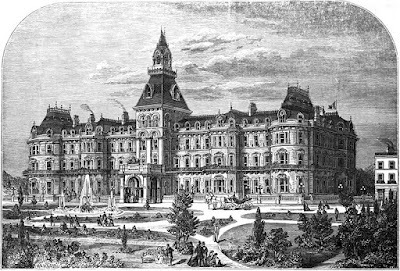 By then, the Porters had inherited her parents’ home in fashionable Russell Square in London, and Frederick continued to practise in London until at least 1874. His Irish-born pupils in London included James Franklin Fuller (1835-1924), whose architectural legacy includes Kylemore Abbey, Co Galway, Ashford Castle in Cong, Co Mayo, the Great Southern Hotel, Parknasilla, Co Kerry, Saint Anne’s House, Raheny, Farmleigh House at the Phoenix Park, Dublin, and the Superintendent’s Lodge at the corner of Saint Stephen’s Green, Dublin. By 1877, however, Frederick Porter was living in Hythe in Kentm where he was building himself a seafront house that he named Moyle Tower in honour of his wife, the former Sarah Moyle. Porter had bought the property, an unfinished hotel, from Hythe Corporation at a knockdown price and set about converting it into an impressive private family home. Frederick and Sarah spent their retirement there, and in 1886 he became Mayor of Hythe, despite not being an alderman. In 1895, he became Master, or Prime Warden, of the Worshipful Company of Saddlers, a City of London livery company. His health started to deteriorate in 1897, and by 1898 he was described as ‘an invalid’ who needed constant care and could only go out in a bath chair. He died on 17 November 1901 and left the very tidy sum of £39,801 in his will. Sarah was raised a Presbyterian and became an Anglican on her marriage. She took an active interest in Hythe’s non-conformist churches. She was a well-known philanthropist and hosted annual parties, or ‘treats’, for up to 50 needy children at Moyle Tower. On the other hand, she complained to Hythe council about the troupes of minstrels who performed on the beach near her house. For the last 34 years of her life, Sarah was a semi-invalid. When she died on 5 March 1912, the flag was flown at half-mast on Moyle Tower. Her funeral was attended by many members of the local Salvation Army congregation. She was buried with Frederick in Saint Leonard’s churchyard. Their son Horatio (Horace) Porter (1861-1918), who inherited his father’s family home at Russell Square in London, studied architecture under his father and eventually inherited his father’s positions as Surveyor to the Clothworkers’ Company and Prime Warden of the Saddlers’ Company. In 1912, he designed the proposed alterations to the Sun Insurance Building in Trinity Street, Dublin, also owned by Sun and Patriotic Insurance. Horace Porter was Mayor of Holborn in 1911-1912, and like his father, a Freeman of the City of London. He died in London on 29 July 1918. Meanwhile, Moyle Tower in Hythe was put up for sale by auction in June 1913. It contained five reception rooms, 21 bedrooms and dressing rooms, stabling and a garage. On the outbreak of World War I, Moyle Tower was used by the army to house men of the Devon Regiment. After the war, it was bought in 1923 by the Holiday Fellowship, and continued to provide affordable activity holidays until 1979. With the Vietnamese ‘boat people’ refugee crisis in 1979, the British Council for Aid to Refugees bought the house and it was a reception centre for 90 people until 1981. It was later demolished and was replaced by an apartment block named Moyle Court.